Last weekend the great weather gods blessed us with some sun so we headed down to Mumbles with the aim of walking a bit of the coastal path that we hadn't so far managed to do. Upon arrival at the Mumbles we were greeted with what appeared to be large snow drifts at the sides of the road and in sheltered hollows on the hills, but which later turned out to be piles of hailstones left over from a storm the night before. Quite impressive nonetheless. We began by exploring the pier and as it was low tide were able to go down on to the beach at the back of the ice-rink. 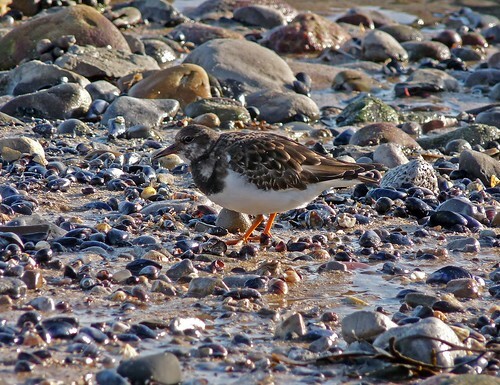 I was very pleased to find a flock of over fifty Turnstones and a lone Redshank avidly feeding amongst the rocks and small pools of water that made up the foreshore. 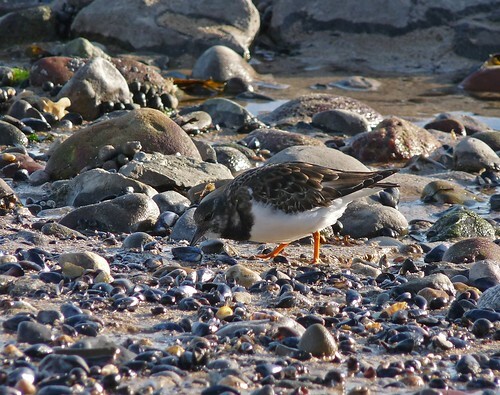 The Turnstones were so wrapped up in their feeding and the occasional raucous quarrel that I was able to sit on the beach whilst they fed all around. The light was very harsh but I managed to capture some good pictures which unlike the ones I took in Fishguard earlier this year hadn't involved me crawling across the beach like a fool. After watching the Turnstones for a while we moved around to Bracelet Bay on the look out for the Mediterranean Gulls that now seem to be permanent residents there. We were not to be disappointed. A personal best of twenty three individuals could be found down on the rocks. 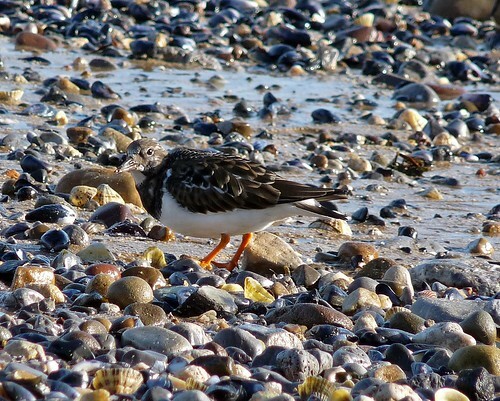 They were too far away to read any of the rings on their legs but other birders have identified a few regular returnees that have obviously taken a liking to the bay. Much more unusual was the sighting of four Common Scoter out on the water. This was only my second sighting of this species and to have it so close to home made it doubly rewarding. The rest of the walk around to Langland was very enjoyable but the weather soon closed in and the light levels dropped dramatically making photography impossible. There were however good numbers of Stonechats present as well as the odd Rock Pipit and Cormorant flying past. After returning to the car we sat and watched the Scoters for a while in the hope of finding the Surf Scoter that had been seen there the day before (we didn't). After observing the Gulls constantly flying into the air to avoid a breaking wave, we began to wonder if birds ever misjudge the waves or just don't see them sometimes. We soon had our answer as a Cormorant that had been sat on a rock drying its wings was swiftly washed off and under the water as a wave came up from behind. The Cormorant popped up a bit further down the beach and waddled quickly back up the beach through the surf before the next wave had chance to catch it again. It looked decidedly sheepish to me!